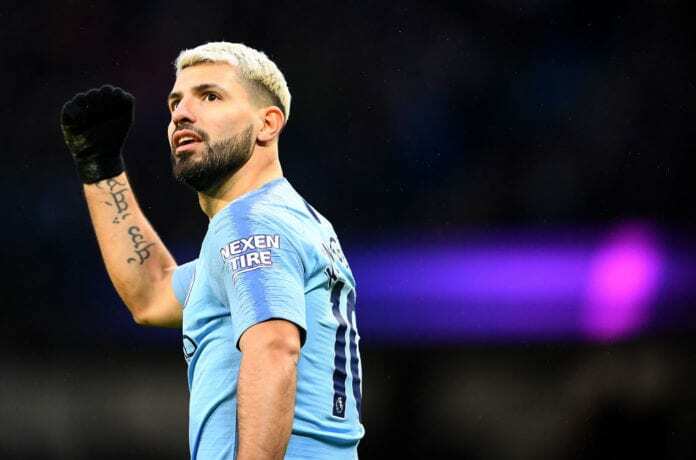 Sergio Aguero put Manchester City ahead with a hat-trick against Arsenal during their match at Etihad Stadium in the 25th round of the Premier League. Arsenal striker Sergio Aguero stunned Arsenal defenders early by scoring the first goal only 46 seconds after the kick-off. Becoming the first player in the Premier League to score a goal in the first minute in two consecutive rounds. Defender Laurent Koscielny managed to get the equaliser for Arsenal at minute 11 with a header after a throw-pass from his Spanish teammate Nacho Monreal. Aguero came back to score the second goal at minute 44th, following a cross by Raheem Sterling to end up in Arsenal’s goal. The first half ended with a 2-1 lead for Manchester City. The Argentinian player came with another goal at minute 61, also following a cross by Raheem Sterling. This is his third goal in that match (hat-trick), with Manchester City advancing 3-1. It is worth mentioning that the Egyptian star Mohammed Al Neni sits on the bench of Arsenal during the match after he participated in their match of the last round against Cardiff City, which ended with a 2-1 win. Pep Guardiola commenting after the match: “After the Newcastle defeat, everyone thought we would go seven points behind. “A lot of things will happen between now and the end of the season. We scored first and kept trying for more, that’s the biggest lesson we can learn. “In the first season, people said I didn’t like (Sergio), but always I was delighted. I am honest; sometimes I played Gabriel or Raheem as a striker. “I prefer to be in the position of Liverpool. The pressure is when you are behind, and you lose points. It’s tougher. The important thing is to be ourselves. Manchester City is now second at 59 points, behind Liverpool at 61 points, while Arsenal is sixth at 47 points.